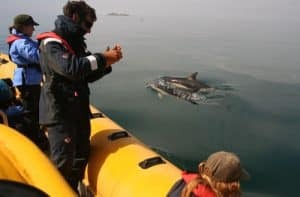 We aim to promote the conservation of Pembrokeshire’s coast and offshore islands and to provide passengers with an exciting, memorable and safe jet boat experience with minimal disturbance to wildlife. We are members of Pembrokeshire Coastal Forum, which seeks to promote best practice in relation to tourism and coastal management. This keeps us informed of the latest environmental initiatives, which we fully support. We were involved in the consultative process in drawing up best practice guidelines for activities around seals, birds and cetaceans. We are also accredited by the national WISE scheme for boat operators working around marine wildlife. We have significant experience in practical ways of minimising wildlife disturbance, for example paying due attention to speed and angle of approach, requesting that passengers remain quiet and do not make sudden movements when close to wildlife. Everything which can be recycled is recycled (paper, cardboard, printer cartridges, plastic, glass, even aluminium). We set up the business from the start to be as respectful as possible of the environment. We invited an external auditor to assess our plans and practices and on the basis of her findings we were awarded Level 2 Green Dragon accreditation. We are the only local boat operator to have achieved this.